As pressure builds from special interests for the federal government to ditch its preference for LEED certification of buildings, the latest version of LEED has been approved, making it more powerful than ever. Members of the US Green Building Council (USGBC) voted overwhelmingly (85%) to include Cradle to Cradle certification in the LEED V4, which will even more stringently enforce the environmental qualities of materials used in green buildings, the opposite of what industry interests want. Developed by pre-eminent architect Bill McDonough and chemist Michael Braungart, Cradle to Cradle certification begins as part of LEED in November. Those seeking LEED certification will get credits for Materials & Resources for disclosing and optimizing where building materials are sourced and purchased. For wood products, the credit requires products “certified by the Forest Stewardship Council(FSC) or USGBC-approved equivalent.” Reused or recycled materials are the other primary means for achievement of this credit. Products sourced within 100 miles are valued at 200% of their cost. During the LEED v4 comment periods (six over three years) there was intense debate about how high to set the bar for materials and resources. FSC argued for maintaining a high bar, using the credit to require key environmental protections and recognize the top performers in any given sector. 27 trade groups representing industries that supply the vast construction industry – including chemicals and plastics industries – have formed the American High-Performance Buildings Coalition, to push an industry-friendly certification, Green Globes. 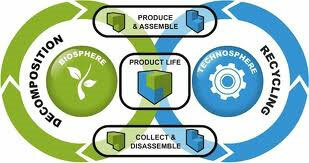 Braungart and McDonough began collaborating on Cradle to Cradle back in 1991 before the USGBC formed in 1993. McDonough used those “waste into food” concepts to design buildings before LEED came on the scene, such as Oberlin College’s Adam Joseph Lewis Center – a building that harvests more energy than it uses, cleanses its own water, and even produces food. The essence of Cradle to Cradle is the importance of a closed loop – that only materials and processes that can be re-used endlessly should be included in product design. And that if these guidelines are followed, humans can live in a world of abundance. It began by certifying products and has since inspired a Cradle to Cradle community in the Netherlands, Park 20|20, and Make It Right, which has built homes using the concepts since Hurricane Katrina (the nonprofit was launched by McDonough and Brad Pitt). Companies that have earned the certification range from leaders in the furniture industry – Herman Miller and Steelcase – to Shaw in carpeting, from Alcoa in aluminum manufacturing toPuma’s closed loop clothing line and Method’s laundry detergents and cleaning products. Their groundbreaking book, Cradle to Cradle: Remaking the Way We Make Things, published in 2002, has been followed by a new book, The Upcycle: Beyond Sustainability – Designing forAbundance. Consider the cherry tree: thousands of blossoms create fruit for birds, humans, and other animals, in order that one pit might eventually fall onto the ground, take root, and grow. Who would look at the ground littered with cherry blossoms and complain, “How inefficient and wasteful!” The tree makes copious blossoms and fruit without depleting its environment. Once they fall on the ground, their materials decompose and break down into nutrients that nourish microorganisms, insects, plants, animals, and soil. Although the tree actually makes more of its “product” than it needs for its own success in an ecosystem, this abundance has evolved (through millions of years of success and failure or, in business terms, R&D), to serve rich and varied purposes. In fact, the tree’s fecundity nourishes just about everything around it. What might the human-built world look like if a cherry tree had produced it?